We are pleased to welcome to the clinic the state of the art dual Long Pulsed KTP 532nm & Nd:YAG 1064nm. 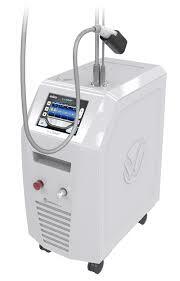 This is the new standard for treating vascular lesions, dyschromia and pigmentation, hair and for skin rejuvenation. The special cooling head, which remains in contact with the skin, cools the skin in advance of the laser beam to protect the skin from damage. Premature aging with pigmentation is caused by excessive exposure to the sun. The changes of pigmentation, age and sun spots can be improved through a process of photo-rejuvenation. The V-Laser variable temperature sapphire window allows us to comfortably treat these unwanted changes. V-laser is used for hair removal from all skin types, and is effective for long term hair reduction. The 1064 Nd:YAG laser allows deep penetration of the laser into the skin to get to the deepest hairs. As with all lasers, V-laser works best on brown and black hair. Usually four to eight treatment sessions are required. Some people may need only three. Paler hairs will often need more.